In the last few weeks we have seen all Midcap Banking Stocks having hit new highs for the year.All the above stocks have given a 25-40% move and the media is buzz with lot of scoops on the same. For the record last 2 months i had consistently mentioned my liking for mid cap banking stocks candidly. All through the month of May our Daily Newsletters to clients and blog postings had a clear mention of taking exposure in midcap banking with medium term view. Although there would be 5-10 posts mentioning about midcap banking stocks and almost all the newsletters in May had mention of the stocks like Uco,Vijaya,Dcb,Dhanlaxmi,Lakhsmi Vilas,Karnataka Bank,City Union etc. Will post a couple of QuickGains Premium Newsletters in which Banking was consistenly mentioned. Hope people are enjoying the rally in these banking stocks. 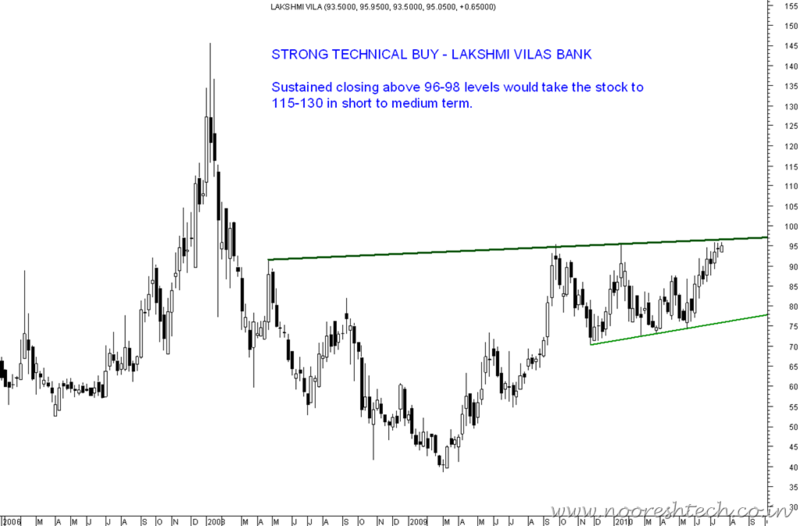 Currently one of the stocks which i have already been bullish looks set for a fresh breakout – Lakshmi Vilas Bank. Disclosure: Recommended to clients at 78-80 and holding will look to add more position in coming days. The stock has faced almost 3-4 times around the range of 95-98. Sustaining above that will take the stock to 115-130 in short to medium term.Encouraging volumes seen on the stock. Fundamentally looked interesting in 80s also for the post have a look here. 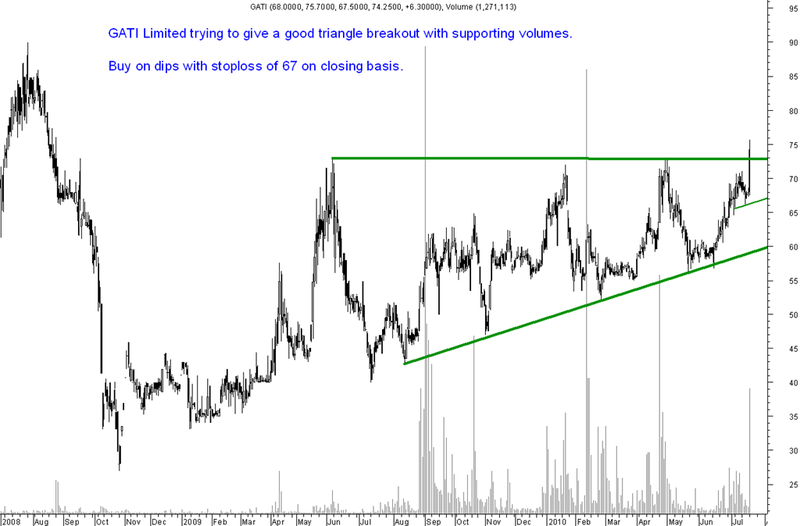 The stock seems to have given a fresh breakout in near term with huge volumes. Stock could give a good 15-20% appreciation. Disclosure: Recommended at 70-72 to clients today. Bharat Forge buy above 337 stoploss 332 tgt 350-360 in momentum. NTPC buy above 203 stoploss 199 tgt 210-212. 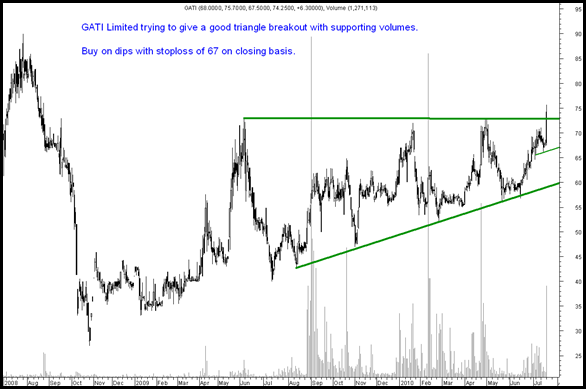 Dredging Corporation and STC India could give a smart move if 630 and 450. The general tendency of the stocks is to move quickly so traders can keep a watch. Fundamental Analysts can have a look into Aditya Birla Chemicals ( Bihar Caustic Old Name ) and DIC India which are as such low liquidity counters but strong on fundamentals. For now my reasons to discuss are purely technical. Expect a good 15% appreciation in short term. Time Techno can give a strong move on closing above 56. To join us in our new venture where we would provide our exclusive advisory services at absolutely NO COST alongwith your trading account with us. Do get in touch with our team Kazim 09821237002 Asif 09833666151 Nooresh 09819225396 ( after market hours only ). Please give your view on BLUE STAR, BOMBAY DYEING & TRIL. Bombay Dyeing holding since 506. Please give your tgts and stop loss on above 3 stocks. Wait for 520 cross on Bombay Dyeing . sir pls guide on gtl infra its not moving and u r bearish on mkts . what should be done here ? 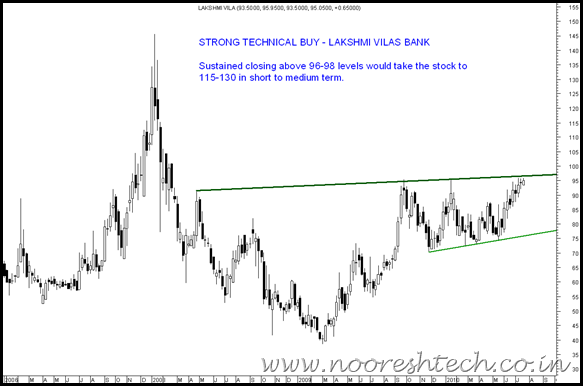 What should be the stop loss for Lakshmi Vilas? sir, whats ur vew on bartronics, which i beleive is good in fundamentals. since february 2010, i have been buying and booking in that counter. as of now it gave moovements between 138/142 to 150+ almost on regular basis. I may not agree on the fundamentals of the company. Technically as of now sideways. Please let me know your view on Federal Moghul Goetze whether to hold or to sell it. I bought @ 155 your feed back is very much required pls guide me..
Sir, please let me know about Bilcare . I bought at 495. What is the target and is it fundamentally good stock.? please guide . The stock seems sideways. Fundamentals are interesting but price is not supporting . What do you suggest for Apollo hospital. I have taken at around 700.. Can wait for longer term but it doesn’t seem to be moving and stuck in a range. I am hoping it should reach closer to 1000. Should i exit this and get into other stocks you have suggested or wait for another quarter? Apollo is a defensive stock at current levels. Would suggest to hold on but can increase exposure to other stocks by shifting part of Apollo.